Have you ever tried caramelized white chocolate? 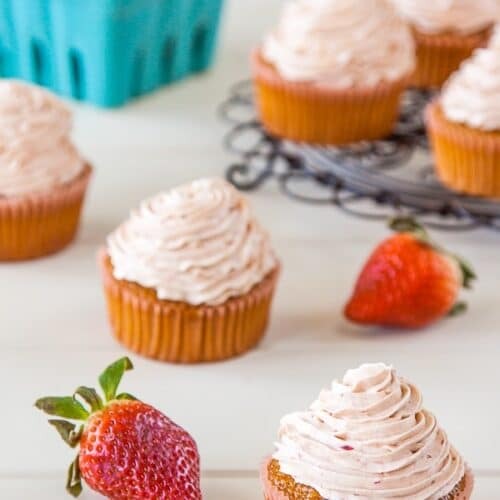 If not, you’re in for a delicious surprise with these strawberry cupcakes! With a soft Italian meringue buttercream frosting and surprising twist to to the cake, these cupcakes will make you wonder how you’ve lived so long without them. The secret ingredient in these adorable little strawberry cupcakes is the caramelized white chocolate. If you’ve never tried it, this is going to be fun! I admit, the thought of putting white chocolate in the oven to roast sounds insane. But it’s an insane stroke of genius because it completely transforms white chocolate into something incredible. Gone is the cloying sweetness, and in it’s place is the most delicious caramel flavor. Think buttery dulce de leche. And if you think you don’t like white chocolate — as I did — this stuff will change your mind. 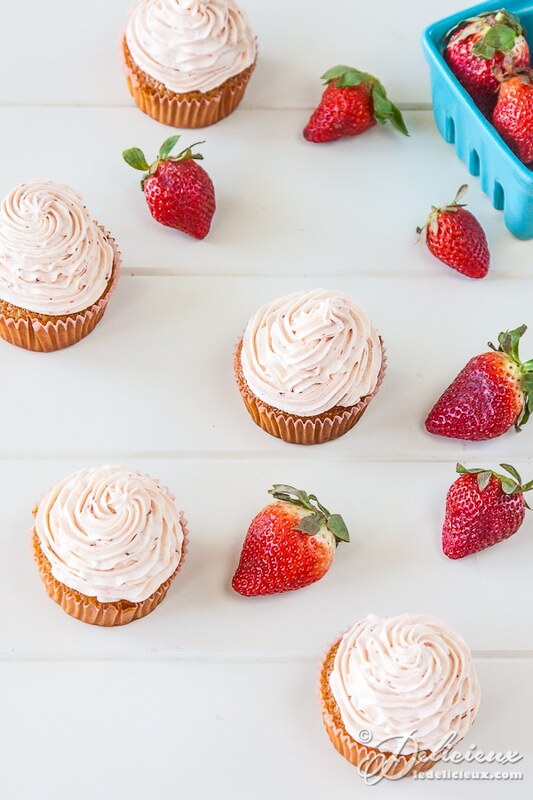 It’s the perfect match for these strawberry cupcakes! 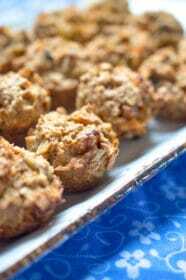 The key to this recipe is to use fresh strawberries, and good quality white chocolate made with cocoa butter, not vegetable fat. Read the ingredients in your white chocolate to see which it uses. The higher the cocoa butter percentage the better, as you will have a smoother result. I used Cadbury’s White Chocolate Melts, which contains 29 percent cocoa butter. When roasting the chocolate, make sure to stir it frequently. The chocolate will go through several stages: melted, firm, and a deeply golden, oozy caramel. If the chocolate looks like it’s seizing up, don’t fret. Give the mixture a stir and it will be okay. Be patient, and you will be rewarded. 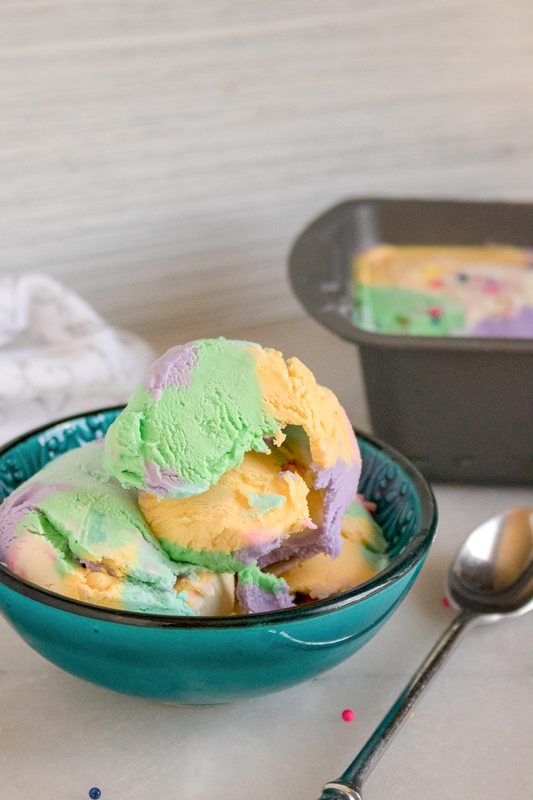 Just try not to eat it all while it’s cooling! For the frosting, I went with a roasted strawberry buttercream. The roasted strawberry frosting works beautifully with the caramelized white chocolate in the cake. And the result — according to my husband at least — is that these strawberry cupcakes are the best cupcakes I’ve ever made. And I have made a LOT of cupcakes. Cupcakes made from scratch are always going to take more time to make than a boxed cake and packaged frosting, but in the end it will all be worth it. 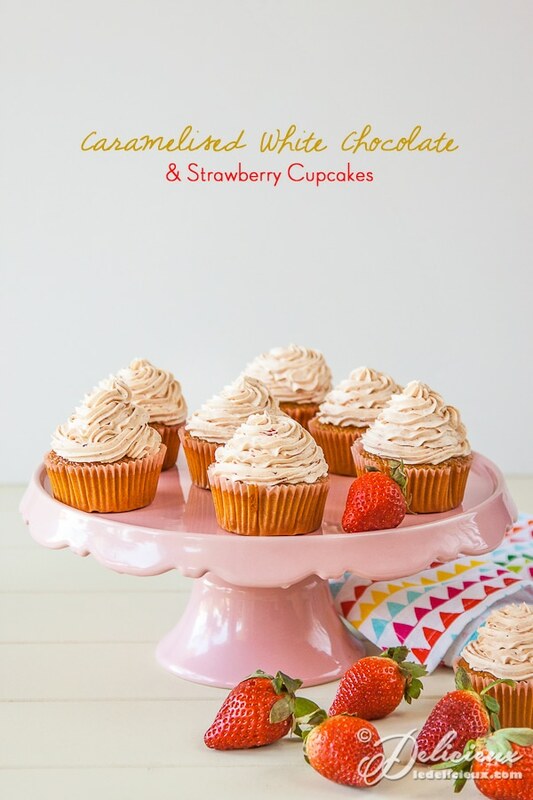 So get ready to dedicate yourself to this amazing strawberry cupcake recipe, and you’ll be glad you did. First, we’ll start with roasting the white chocolate. It will roast for 60 minutes at 250 degrees Fahrenheit. Make sure that every 10 minutes you stir the chocolate so that eventually it turns into a delicious caramel color. While that’s happening, prepare you strawberries. Place the strawberries in a baking dish with two teaspoons of sugar and let them roast as well, for 30 to 40 minutes. You’ll know they’re done when they collapse and create a pool of juices. Then set them aside to cool. Then comes time to make the cake. Increase the oven heat to 340 degrees Fahrenheit. Then while it’s preheating, take the cooled (but still melted) white chocolate in a bowl and mix it with the melted butter. In a separate bowl, whisk the eggs and brown sugar, add the chocolate and melted butter mixture, and then whisk all those ingredients together. In yet another bowl, combine the flour, baking soda, and salt. Once that’s mixed, add a third of it to the chocolate mixture and mix well. Then add the following, whisking after each addition: half buttermilk, a third of the flour mixture, rest of the buttermilk, the rest of the flour. Now, you have made the cake! Spoon the mixture into your cupcake liners and bake for 15 to 17 minutes. Then set your cupcakes on a cooling rack. And finally we get to the strawberry part of the strawberry cupcakes. The strawberry is the key ingredient to the buttercream frosting. Put the water, golden syrup, and sugar in a saucepan and mix until combined, then bring to a boil. 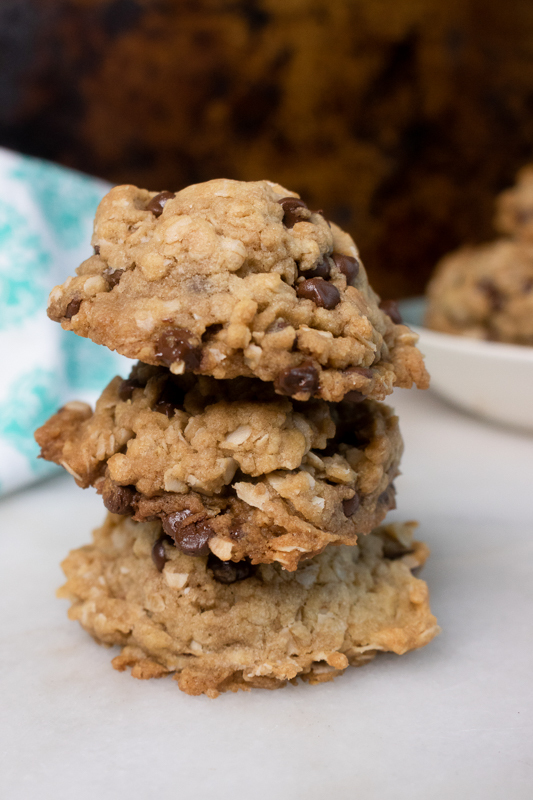 When the mixture reaches 248 degrees Fahrenheit (use a sugar thermometer to gauge this), remove it from the heat. Then add your egg whites and whisk. Slowly pour your sugar into the bowl while still whisking. You’ll keep whisking for about 10 minutes, or until the mixture is cool. Next comes the essential ingredient to all buttercream frosting: butter! Add a third of the butter and whisk it completely into your mixture, and continue adding and whisking until you’ve added all the butter. Turn your electric whisker on high to make the frosting nice and fluffy. But remember those strawberries you roasted? Now is their time to shine! 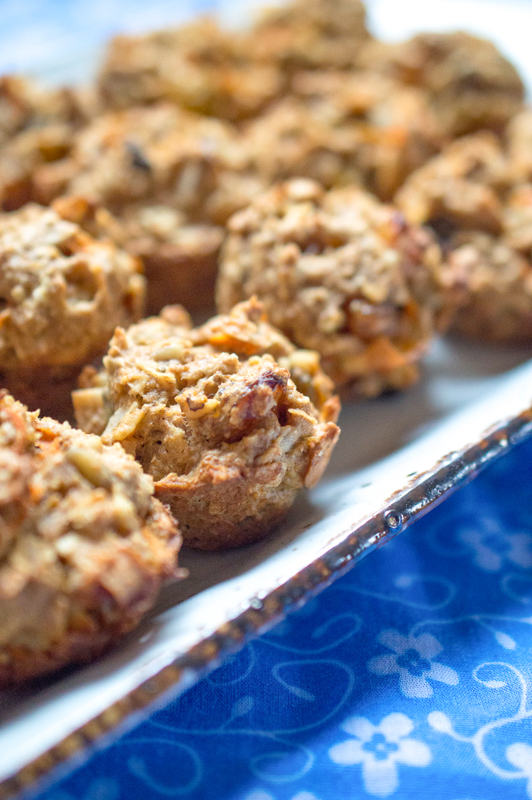 Put them in a food processor and add frosting. 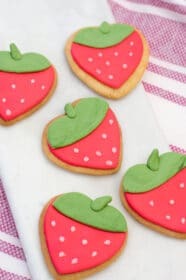 Mix them into the butter mixture to make your strawberry-buttercream frosting. Put the frosting in a piping bag, and frost those cupcakes up! 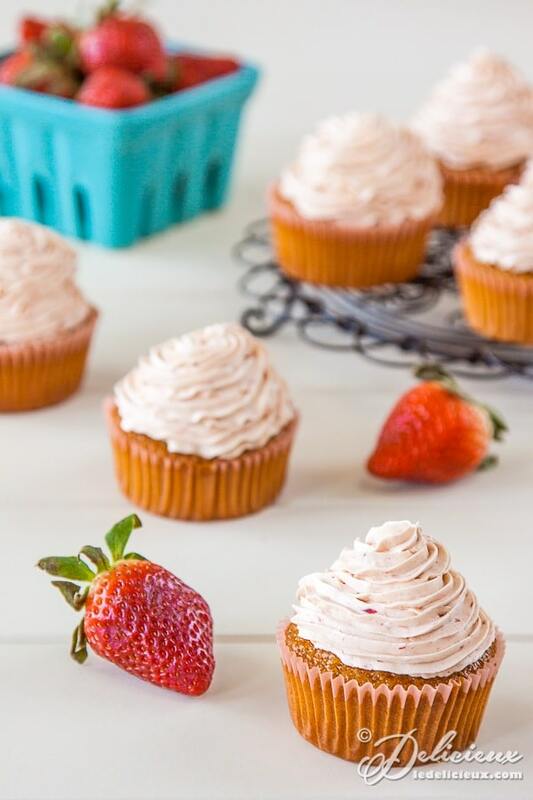 You're in for a delicious surprise with these strawberry cupcakes! The cake is infused with an incredible caramelized white chocolate, and then topped with a homemade strawberry-buttercream frosting. These cupcakes will make you wonder how you've lived so long without them. Begin by roasting the chocolate. Preheat the oven to 250 degrees F, and add the chocolate into a small baking dish. Place in the oven for 60 minutes, stirring every 10 minutes, until a deep caramel color. While the chocolate is roasting place strawberries in a small baking dish and toss with the 2 tsp sugar. Roast for 30 to 40 minutes, or until the strawberries have collapsed and are surrounded by a puddle of their delicious red juice. Set aside to cool. Place the cooled but still melted white chocolate in a bowl and add the melted butter and stir until smooth and combined. In a the bowl of an electric mixer whisk together the eggs and brown sugar until the sugar is dissolved. Add the chocolate and butter mixture and whisk until well combined. 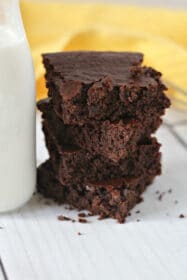 Combine the flour, baking soda and salt into a separate bowl and add one third of the flour mixture to the chocolate mixture and mix until well combined. Follow with half the buttermilk and mix until combined. Add another third of the flour mixture, mixing until combined, before adding the remaining buttermilk and flour. When the mixture is thoroughly combined fill a 12 cup cupcake pan with paper liners and divide the mixture between the cupcake liners. Bake for 15 to 17 minutes of until the cupcakes spring back when pressed. Remove from the oven and cool on a wire rack. To make the Italian buttercream place the sugar, golden syrup and water in a saucepan and mix until well combined. Use a pastry brush to dislodge any stray grains of sugar before placing over a high heat. Bring to a rapid boil and add a sugar thermometer. Cook until the mixture reaches 248 degrees F, and remove from the heat. Place the egg whites in the bowl of an electric mixer and whisk to soft peaks. With the mixer running, slowly pour the sugar syrup into the bowl, being careful not to touch the whisk, and continue whisking until the mixture cools, around 10 minutes. Add the butter, one third at a time, and whip until fully incorporated. Switch the mixer to high and whip until fluffy. If the mixture turns soupy and runny and doesn't become thicker simply refrigerate for 30 minutes to an hour and whisk again. Puree the roasted strawberries in a food processor and add to the frosting and whip until combined. Fill a piping bag fitted with a star shaped nozzle with the Italian meringue buttercream and pipe onto the top of each cupcake in whatever pattern you desire. It’s important the Italian meringue cools down enough before you begin adding the butter. The bowl of the mixer should be cool to touch. I like to set a timer for 10 to 15 minutes while whisking the egg whites and once the time is up and the bowl is cool I begin adding the butter. Add the butter to soon and the frosting could melt and turn the meringue into a soupy mess. If that happens don’t stress. Simply refrigerate the mixture in the mixing bowl for an hour and begin whipping again before adding the remaining butter and flavouring. Can you tell me where you purchased your chocolate? I am having difficulty finding the good quality white chocolate that you recommend. This Valrhona white chocolate on Amazon is a good place to start. Also check out Lindt classic recipe white chocolate. Both use cocoa butter instead of vegetable oil as this is necessary to be able to caramelise the chocolate. So – once it’s caramelized, how long will it keep? I’m not exactly sure yet. Once the chocolate cools completely it re-hardens so I would think it would keep for a while. Oh my goodness – I must have these, and soon! I’ve heard about caramelizing white chocolate, but never tried it – I’ll be fixing that quite soon! I am a sucker for anything with strawberries at the moment. Oh how I love them. These are gorgeous! Isn’t caramelized white chocolate incredible? I love the combination with strawberries here…so delicious. I’ve never tried caramelized white chocolate but I’ve heard wonderful things and now I must. Beautiful cupcakes! Heavenly cupcakes! Those falvors are so wonderful. Never heard of roasting chocolate. I always assumed it would seize and be fit for the rubbish. These look gorgeous! 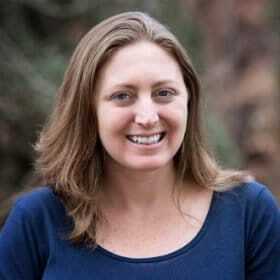 Jennifer, I love you blog. 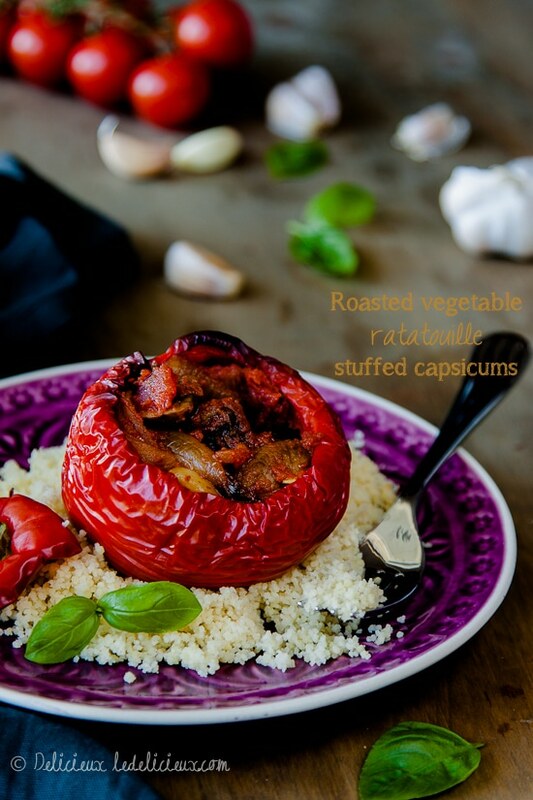 The photos and recipes are fabulous. These cupcakes sound wonderful. What a great combination – white chocolate, strawberries and that buttercream! I adore caramelised white chocolate, I bet these are wonderful! Perfect for the lush winter strawberries we’re getting at the moment.